Sundance Now is a subscription based streaming service. The subscription includes access to a gripping and rich selection of films, documentaries and series focused around true crime, political thrillers and dramatic series. They offer a 7-day free trial to access their content before starting payment. AMC’s primary goal was to increase the total amount of subscribers to the Sundance Now platform while decreasing customer acquisition costs. A secondary goal was to improve subscriber retention rate as a means to increase customer lifetime value. Given that lifetime value of a website purchase tends to be greater than that of an in-app purchase, we needed to dramatically increase the percentage of website purchases compared to those that took place inside the Sundance Now app. Previous advertising efforts were primarily driven by specific titles offered on the platform and did not do much to raise awareness for the Sundance Now platform as a whole. Our team was tasked with developing strategies that would leverage branding efforts as way to profitably grow the subscriber base beyond what could be achieved through title-driven campaigns. We believed that this segment of customers would yield better retention rates. Advertising campaigns benefit from consistent and continuous messaging. This results in greater ad-recall and improved conversion rates. Prior to bringing us on, the Sundance Now advertising campaigns were mostly title-specific. That is, they heavily promoted new title releases and had not focused on developing the branding of their platform as a whole. Title-driven ad campaigns are inconsistent by nature. The content offered on Sundance Now frequently changes, and there are always new titles to promote. The lack of consistency resulted in low ad-recall and higher costs per acquisition than is typical. We needed a strong creative strategy to compete with the likes of Netflix, Amazon, Hulu, and other colossal streaming services. As their marketing agency, we needed to help them understand what makes Sundance Now unique and build branding campaigns around that. Without a developed persona and an understanding of who their target customer really is, it was originally difficult to build a brand story that would appeal to potential subscribers. We were challenged with understanding the different personas of the Sundance Now fanbase and using that to develop our brand positioning. We found that customers who signed up as a result of title-driven campaigns were more likely to cancel their subscription before their free trial period ended. We needed to find a way to earn customers that cared more about the quality of our overall library instead of just one specific title. It was clear that a multi-channel branding initiative would be key to the growth of Sundance Now. The main goal for this initiative was to establish brand positioning, showcase the value of the platform, and add personality to the Sundance Now brand. These campaigns had a longer term approach that factored in other micro-conversions such as ad recall, direct traffic growth, and view-through-conversions. 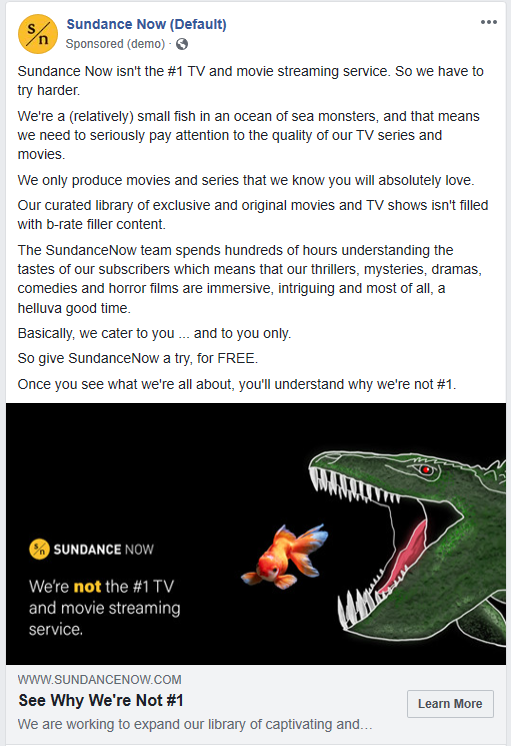 Our first campaign, referred to as the Big Fish/Little Fish campaign, attempted to establish positioning for the Sundance Now brand in the massive sea of streaming services. Through this campaign, Sundance Now is making a bold statement: We don’t care about being number one because we focus on producing movies and series that we know you’ll absolutely love. We’re not for everyone, and that’s OK. But if you have a sophisticated palate and care about the quality and intellectual prowess of the content you consume, then give us a try. In Oglivy On Advertising, David Ogilvy explains how his agency transpired this ad concept into one of the most powerful campaigns in advertising history. In the ads, they explain how there is no rest for them, they can’t afford to take you for granted, and the line at their counter is shorter. All of these reasons took customers away from Hertz, who was number one at the time. Al Reis and Jack Trout elaborate on this concept in The 22 Immutable Laws of Marketing, stating that the marketing strategy you use depends on which rung your brand occupies on the ladder. Hertz had a reputation in most consumers’ minds as the incumbent leader in rental cars. For 13 years, Avis ran ads attempting to compete for that rung on the ladder, most notably with their failed “Finest in rent-a-cars” campaign. When Avis had accepted their position on the ladder, they were able to use that position to their advantage. Not everyone in the market is interested in the biggest car rental company (Hertz, at the time), rather, they want to find the best. In addition to claiming that their position on the ladder forces them to work harder, the ad also suggests that the large incumbent is lazy, and therefore, the customer is lead to believe that Avis is the better choice. It would be foolish for us to suggest that consumers cancel their Netflix subscriptions in favor of Sundance Now. The Big Fish/Little Fish campaign helps consumers understand the value of Sundance Now as a platform and where we stand relative to other streaming services. You will not find mindless, low-brow escapism within the Sundance Now library. Rather, the highly-curated titles include riveting true crime, exclusive thrillers, and dramatic series that permeate through the screen and into your living room. It impacts the people you hang out with, the conversations that you have, and even the food you eat. Food recipe videos are popular, highly recognizable, and easy to share on social media. We took an alternate approach by curating a specific list of recipes that would pair well with a Sundance Now subscription. Appetizers and snacks are symbolic to how great film jumps out of the television and becomes a shared experience. The hand-picked recipes included a twist of sophistication, curiosity, and unconventional ingredients and cooking methods. All of which bring people together and enhance the movie night experience. Our first video was our popcorn video (shown here) that we used as proof of concept to get the client’s green light for full video production. Once we had the green light, we created a Pita Style Pizza as our first recipe. We needed to ensure that the video was lighthearted and didn’t come across strictly as an advertisement. The goal of the video was to bring awareness to the brand personality and increase recall, but not necessarily to sell anything. The initial launch of the Pita Style Pizza video garnered useful data that would be used to improve iterations of future recipe videos. The next round of videos included Grilled Cheese Tacos, Peppermint Oreo Truffles and Bourbon Hot Chocolate, all of which resulted in higher engagement rates and ad recall than our original versions. As our team implemented longer term strategies related to developing the brand image of Sundance Now and appealing to the correct target personas, our team placed extreme emphasis on short-term wins within the PPC and Social Media Advertising accounts. In particular, restructuring Facebook and Instagram campaigns to consider each stage of the buyer’s journey, and optimizing the Google Ads and Bing Ads account to reduce wasted spend and improve budget efficiencies. Cost savings from these short-term wins freed up budget to be reinvested in implementing new tests that optimized for our long term goals. Although we started out with a fairly broad goal, we were able to introduce new concepts to increase brand awareness and positive association with the brand name. Not only did we achieve this from our creative ad concepts, we were able to capitalize on this through all channels. Our social campaigns promoted the videos and poster in our top of the funnel reach campaigns and our search campaigns were carefully articulated to capture the branded search traffic, which dramatically increased as a result. Most importantly, we made sure to put the message in front of potential customers several times to boost ad recall. Our YouTube campaigns for the recipe videos have a significant budget behind remarketing, to ensure the brand messaging is reaching our audiences who have previously interacted with our website or mobile app. We achieved long-term growth and significant improvements in customer retention with a flushed out top of the funnel creative strategy. In Google Ads, since we started running the YouTube campaigns, we increased branded conversions by 1,308%, decreased cost per conversion by 65% and increased conversion rate by 195%. Within our YouTube campaigns specifically, we earned 2,513 views and 466 conversions and maintained a cost per conversion of $27. Within our Facebook campaigns, we were able to achieve significant reach and brand awareness, reaching 1,797,969 people with our recipe videos. Dedicated to creating and distributing bold and inventive stories fueled by the artistic vision of dynamic storytellers, AMC Networks owns and operates several of the most popular and award-winning brands in television and film.